The MCerberus® MCB-100 Series product line may be utilized by the User to monitor equipment and other processes. The MCB-100 product will send a text message if a piece of equipment turns ON, turns OFF, and/or turns ON or OFF (programmable). An alternating current (AC) probe is utilized to monitor a piece of equipment (included). When the measured current exceeds or drops below a programmed trigger level for a period of thirty (30) seconds, a text message is generated. NOTE: We have been asked to make this value a programmed value. This update is in process. The text message (via email) is transmitted via the local WiFi network via Port 2525 to our SMTP relay server. 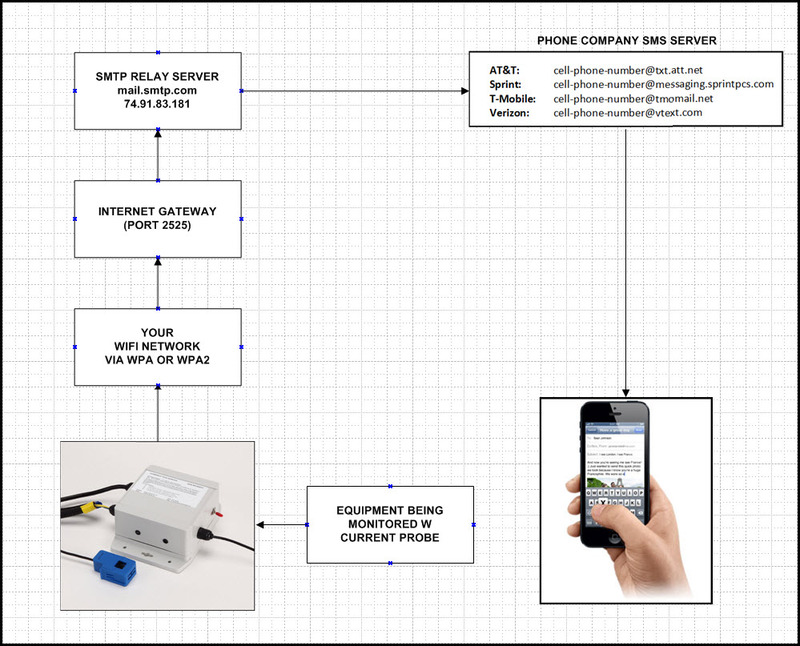 The relay server transmits the text message to the appropriate phone company SMS server. The phone company SMS server transmits the text message to your phone. Your cell phone typically will receive the text message within one minute after it is sent. WARNING: The time your cell phone service provider “sends” you this text message may vary and depends on network volume. The longest delay we have personally observed is five (5) minutes with Verizon. Our testing was completed on AT&T networks and the delay was well under a minute. The following schematic illustrates the overall function of the mCerberus® MCB-100 product series.